I'm thrilled to be taking part in the MGM Blogathon sponsored by Diana and Connie of Silver Scenes and running from June 26th - 29th. MGM is justly renowned for its epics such as Ben-Hur: A Tale of the Christ and The Big Parade, its meticulously crafted costume dramas like Camille and Marie Antoinette, and its gloriously talent-stuffed musicals like Singin' in the Rain and The Wizard of Oz. MGM is not the first studio that leaps to mind when considering that Hollywood staple, the western. The studio's western output of the 1920s is barely more than a dozen features, but they can boast of a genuine genre star in Tim McCoy. The real-life sharpshooter and Native expert's storied career from soldier to film star to Ringling Brothers performer would be as interesting as any of his movies. In the 1940s MGM's westerns were mainly used as buffoonish vehicles for Wallace Beery (Jackass Mail, The Bad Man). They stepped up during the 1950s, a golden era for the genre, releasing a small but laudable group of titles including Devil's Doorway, Stars in My Crown, Westward the Women and The Naked Spur. MGM's western output in the 1930s was dismally sparse and included mainly musicals like the operetta The Girl of the Golden West with Jeanette MacDonald and Joan Crawford in Montana Moon, and comedies such as William Haines in Way Out West and Frank Morgan in Henry Goes Arizona. However, in the middle of the decade ,MGM surprises us with a gritty and artistic version of a venerable story by Peter B. Kyne. 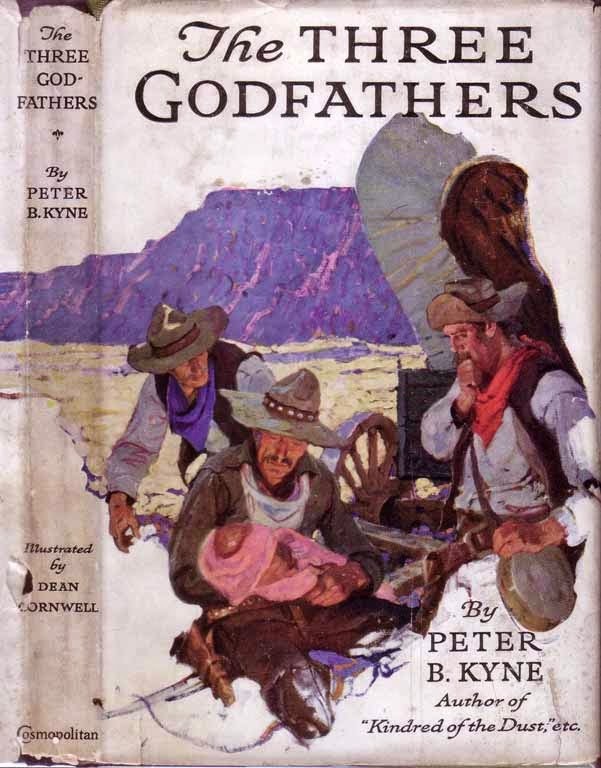 The timeless Christmas tale of redemption The Three Godfathers first published in 1913 is the story for which Peter Kyne is best remembered thanks to the many film versions beginning in 1916 with The Three Godfathers directed by Edward LeSaint up to television with 1974s The Godchild directed by John Badham. William Wyler's Hell's Heroes in 1929 was the first sound version of the story. You can read Jim Lane's excellent article on that film here. The animated features 2002s Ice Age and 2003s Tokyo Godfathers owe more than a passing debt of gratitude to that long ago Saturday Evening Post serial. Spoiler alert: the discussion of the story and film here will make the bold assumption that you are familiar with The Three Godfathers either in its original form or from one of its many filmed adaptions. "Four Bad Men had ridden into Wickenburg that December afternoon, but only three rode out. One of the three had a bullet hole through his left shoulder." The Worst Bad Man, The Wounded Bad Man and The Youngest Bad Man make their way across a desert to elude a posse and come across a stranded and recently widowed young woman about to give birth. The unfortunate woman asks the unholy trio to care for her child, placing most of her hope on The Youngest Bad Man. The Wounded Bad Man is the first to realize that their young compatriot is the truest hope for the child as neither he nor The Worst Bad Man possesses the strength to complete the arduous journey to civilization after the loss of their horses and potable water. The Youngest Bad Man, a newcomer to the outlaw world, is also the purest of the trio and one The Wounded Bad Man hopes will be able to go forward and live a more blameless life for the sake of his fellows. The screenplay for this 1936 film version of the story is by Edward E. Paramore Jr. (The Virginian, The Bitter Tea of General Yen, Three Comrades) and Manuel Seff (Woman Chases Man, Trouble for Two, Blessed Event). 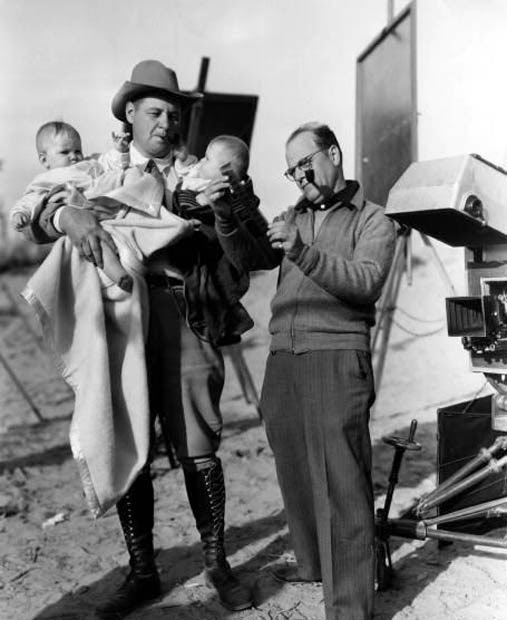 Joseph Ruttenberg, four-time Academy Award-winning cinematographer (Gigi, Somebody Up There Likes Me, Mrs. Miniver, The Great Waltz) here plied his trade on location at Mojave and Red Rock Canyon State Park. The sense of desolation and weariness brings the viewer uncomfortably into the world of the story. 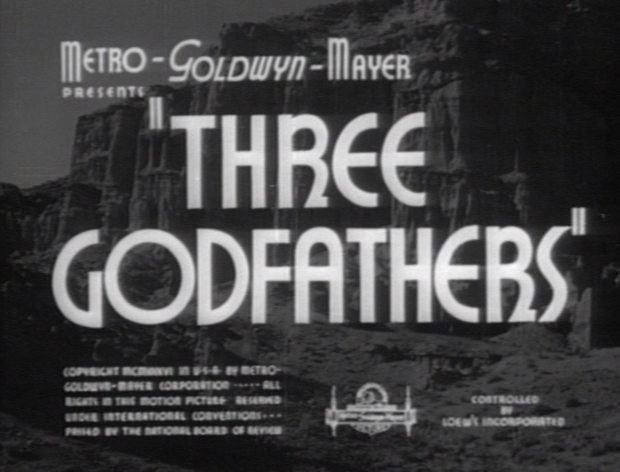 Three Godfathers was directed by Richard Boleslawski (Rasputin and the Empress, Les Miserables, Theodora Goes Wild). Director Boleslawski is described by actress Marilyn Knowlden (young Cosette, Les Miserables) in her autobiography Little Girl in Big Pictures as "a great bear of a man ... perfectly costumed in the role of director, with his leather-front sweater, pipe, and ascot tie." Boleslawski, a student of Constantin Stanislavski, was at the forefront of bringing that "method" of acting to the 20th-century theatre. He founded the American Laboratory Theatre in 1923, and published Acting: The First Six Lessons in 1933. Spontaneity and sincerity were the hallmarks Richard Boleslawski sought from his actors. The setting of New Jerusalem is presented as the hometown of Bob, The Worst Bad Man, played by Chester Morris (The Big House). He takes particular glee in robbing the "hypocrites" at Christmas. Bob torments his former love, Molly, played by Irene Hervey (Destry Rides Again) and her betrothed, a bank clerk played by Robert Livingston (The Three Mesquiteers). The vibrant Morris gives us a character brimming with cynicism and contempt. Everyone is a sucker and he uses their sentimentality against them. Lewis Stone (Grand Hotel) plays the outlaw known as "Doc", The Wounded Bad Man, and by his manner and interactions with the townspeople, we learn that he is an educated man from New England, a wry observer of humanity. It is Doc who clearly sees the hopelessness of their situation, keeps Gus on the side of the angels, and uses all of his power to convince Bob to "give the kid a break". Bob's chilling response: "I'll give him a break. If he wants to crawl to New Jerusalem I won't stand in his way." For it is back to New Jerusalem they must travel, the shortest way to civilization, the longest way to Bob's redemption. Doc is the first of the trio to die. In a quiet and unforgettable scene, Doc, alone with his books and a gun, recites Macbeth's famous soliloquy from Act 5 of that play. We hear Stone's resonant voice as the camera follows Gus and Bob walking away with the baby, then a single shot. Walter Brennan (Red River) plays "Gus" who claims to be the world's oldest outlaw. At first glance, Gus appears to be a stock comic relief character, but he proves to be quick on his feet, adept at his trade and entirely loyal. Gus is a man seemingly addicted to lying yet played by Brennan with a refreshing lack of artifice. On one level he has understood the import of their task, but the only way he can continue is by trying not to think about this being his end. When the full realization of his situation hits him Gus recites a prayer from his childhood, ashamed that he cannot recall it entirely and embarrassed by Bob's cynical derision. While Bob and the child sleep, Gus will wander off into the desert to die. The baby in this version of the story is a sturdy, trusting crawler starting to teeth (twins Jean and Judith Kircher), rather than a newborn. After Gus' death, Bob takes the loot and leaves the child on a blanket. A few yards from the infant Bob turns and fires his gun. He has shot a rattlesnake crawling perilously close to the child. Bob admonishes the baby for making him kill the innocent critter. The die is cast. Kyne's original story does not specifically state that The Youngest Bad Man dies when he reaches the next town with the baby, only that he collapses. The extent of his privations lead his death to be a natural conclusion, but prior to arriving at the saloon, he has been imagining the life he will make for himself and the baby. In John Ford's 1948 version of 3 Godfathers (an Argosy Pictures production distributed by MGM) that dream is realized in the ending. You can read Kevin Deany's look at that film here. 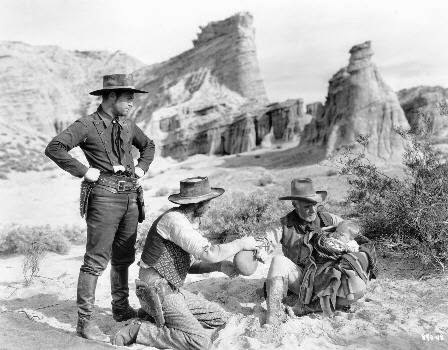 Ford had filmed the story previously in 1919 as Marked Men starring Harry Carey. I don't know how he ended that film, but I hope that as in the 1948 film he included my favourite part of the book. It is when the outlaws struggle to care for their helpless charge following instructions found in a book by a 19th century Dr. Spock. The 1936 film gives us no doubt as to the fate of Bob, The Worst Bad Man. An hour away from New Jerusalem and knowing his strength is failing, Bob drinks from a poisoned water hole. Doc had mentioned when they had passed this way on the run that the poison would take about an hour to kill. Bob's sacrifice is done with this knowledge. He stumbles into New Jerusalem and, more dead than alive, drags himself to the front of the church during Christmas service. He places the child in Molly's arms and leans against a pillar where hangs a crown of thorns before collapsing in death. The last close-up of the film is not on the man we have journeyed with, but with his legacy as Molly resolutely leaves the church with the rescued child. The hope of the Three Bad Men. The Three Godfathers is an unforgettable story that works as much as an adventure as an exploration of the depths of men's souls and the ironic twists of fate. It is understandable that it has inspired so many films. The IMDb lists two films projects as currently under production, one with a contemporary setting. Using the same plot different directors and screenwriters have been able to reach our hearts and minds, with audiences claiming one or more of the films as "ours". The rugged determination in the face of destruction is what touches me most in Richard Boleslawski's Three Godfathers. I am only familiar with the John Wayne / John Ford version of the movie. So cool that this one includes great character actors like Walter Brennan and Lewis Stone! And, thinking well, Ice Age is indeed a retelling of this story - but with the twist that nobody dies. The Ford version was often shown on TV and that was my introduction to the story as well. I love this story, C.W. Don't think I ever saw this version though. I'm more familiar with the John Wayne edition. :) But I love Walter Brennan and Lewis Stone. (Hard to imagine him in a western.) I think I'll hunt this one up. A lovely review, m'dear. Lewis Stone fit well in costume dramas, but being an MGM man the opportunity to appear in a lot of westerns was denied him. Of course, he mightn't have looked at it that way. 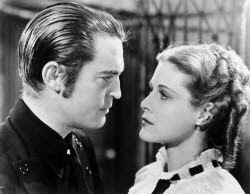 As far as I can recall, this is the only time Chester Morris was cast outside of the 20th century in a movie. Just remembered him on an episode of "Zane Grey Theater". I think you'll be impressed with the film. I like the mix of realism and romanticism in this film. Have you seen Hell's Heroes? I feel like this might have aged better as the sound had developed much more; I imagine there's more dialogue and so better character development. My only viewing of "Hell's Heroes" was late night and I was very tired. The impression in my memory is of the isolation and desperate situation. Leave it to you to find a great western made by MGM. You've made me curious to see the original of this oft-told story. Your writing is superb, as always, CW. Westerns were bread and butter to some studios, but MGM was an exception. Of course, when they went for a classic story they went all the way. I've only ever seen the John Ford version of this story. This version has been on my to watch list for a long long long time now, and I should really probably get to it after all this time. I'm not sure why I have put it off for so long. I mean, I simply adore anything Chester Morris does. So what's my problem. I think your great take on the film has finally forced my hand. Watch it I must. Thanx for the push. See ya 'round the web. All Things Kevyn. Chester Morris is just the kind of guy that makes you adore him. He's great in "Three Godfathers". I really think that movies come to us when they are supposed to, and now is your time. Like others here, I've not seen this version--but wow. This sounds wonderful. And MGM. Who'd have thunk it? A really great post, CW. It's funny how we discover that familiar films may have had previous lives. It's as if we don't know the whole story unless we've seen all of them--and read the book, too, if there ever was one. The history of Kyne's story in print and on film fascinates me because it is ongoing. Will one of those versions now in production become classics or favourites? Time will tell. I think this is a movie you will appreciate, JTL. I didn't realize this was an MGM movie! It makes me a little "verklempt" every time I see it. It is SO well done. I LOVE how you labelled the men "Worst Bad Man", "Wounded Bad Man" and "Youngest Bad Man". Very clever. MGM did what they did very well, but every once in a while they could genuinely surprise us and "Three Godfathers" was one of those times. I was following Kyne's lead with "Worst Bad Man", etc. although he did give his characters names, that was the way he introduced them to readers. It always stayed with me. 1967 in Film Blogathon: Who's Minding the Mint?